For the Sharks third year forward Matt Nieto, this season looks to be one that will define his career. Nieto is only 22, so it might seem early for a defining season. But players who are young need to show improvement. Nieto’s 2014-15 season was not much different from his rookie campaign. What is considered promising for a rookie is not as exciting in year two. Of course, many players have a sophomore slump. What is almost certain, a repeat of what he has shown the first two seasons won’t be enough to keep him regularly in the line-up in year three of his career. Nieto is not a physically imposing player. He is a smaller forward, relying on good agility and great speed to make an impact. When Nieto entered the 2014-15 season, he had an opportunity to show he belonged as a top-9 forward. He spent a considerable portion of the season on the Sharks second line. Alas, Nieto struggled in several ways. His point production flatlined. As a rookie, Nieto played in 66 games, posting 10 goals, 24 points and was -4. Last season, Nieto played in 72 games, scored 10 goals, had 27 points and was -12. Worst of all, he was last on the Sharks in GA60 (goals allowed per 60 minutes at even strength), the only Sharks player with a GA60 of over 3.00. The player who was second to last in that ranking was Adam Burish. The Sharks sent Burish down to their AHL affiliate in mid-season and bought out his contract this summer. On the more positive side for Nieto were some of the advanced stats, including a Corsi solidly above 50% and a PDO which suggests he may have been somewhat unlucky over the course of last season. An NHL roster typically carries 14 forwards, 12 play on any given night. Nieto obviously falls behind the top five forwards: Joe Thornton, Joe Pavelski, Logan Couture, Patrick Marleau and Tommy Wingels. After this group, though, Nieto had his opportunity to rise as far as he could. His most common linemates last season (by a lot) were Patrick Marleau and Logan Couture. Nieto had a shot to be a top-6 forward. Nieto has effectively been passed on the depth chart by Melker Karlsson, Chris Tierney and the recently acquired Joel Ward. Last year’s acquisition, Ben Smith, is also looks to be ahead of Nieto. 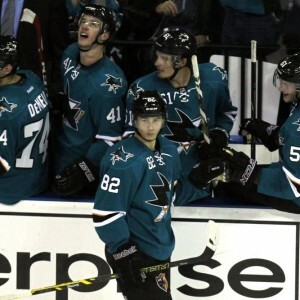 Tomas Hertl, so brilliant as a rookie prior to his knee injury, is also currently ahead Nieto. 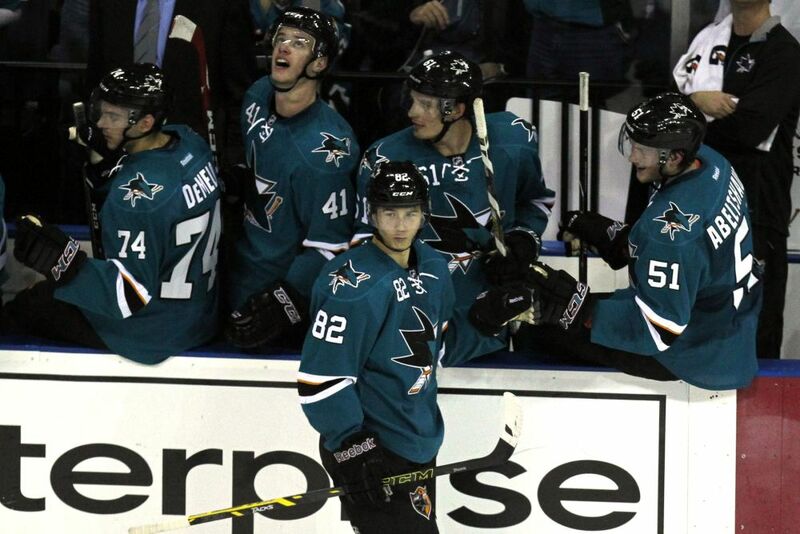 Like Nieto, Hertl is entering his 3rd season. We’re up to ten forwards now ahead of Nieto. As the Sharks have evolved over the past year, they have become smaller and less physical, meaning larger and more physical players fill a needed void. In that regard, Barclay Goodrow, even if he hasn’t passed Nieto on a straight performance basis, does a better job of fitting a team need: a bigger, more physical forward. Despite playing in fewer games last season, Goodrow had more than three times as many hits as Nieto. Goodrow is listed at 3 inches taller, 25lbs heavier than Nieto. When they stand side-by-side, the difference looks bigger than that. At this point, Nieto appears to be the 12th forward. A roadblock for Nieto could be Raffi Torres. Torres has missed most of the last two seasons dealing with multiple knee surgeries. His healthy and effective return is anything but certain. Still, should he return and retain a reasonable portion of his skills, he could quickly pass Nieto on the depth chart. Should Torres return and be effective, Nieto is probably the 13th forward on the roster, a spot that doesn’t play on a nightly basis. Working in Nieto’s favor, the Sharks are pushing up against the salary cap. This means a near-term acquisition to upgrade talent on the forward lines is unlikely. The only roster forward behind Nieto is Mike Brown, whose skills are limited to the role of pest and fighter. The Sharks have no proven NHL-level talent beyond these 14 forwards already mentioned here. 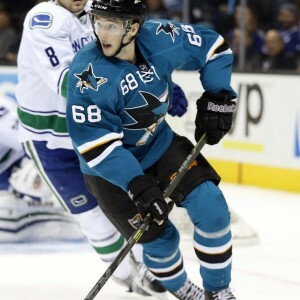 Last season, the Sharks parted company with 3 such players in Tyler Kennedy and James Sheppard in return for draft picks, along with the aforementioned Burish (a fourth player, Andrew Desjardins was traded for the previously mentioned Ben Smith, roughly a trade of equals). Nieto may have a longer leash given how thin the ranks are behind him. A new wrinkle may also help Nieto. Many predict that 3-on-3 overtime hockey will favor speedier players. If that prediction comes true, Nieto may be a beneficiary. While the ranks may be thin in terms of proven experience, the Sharks have plenty of prospects that could push for a job in San Jose. None of players most likely to push Nieto out have shown anything at the NHL level, yet. The more notable prospects are Nikolay Goldobin, Nikita Jevpalovs and Timo Meier. 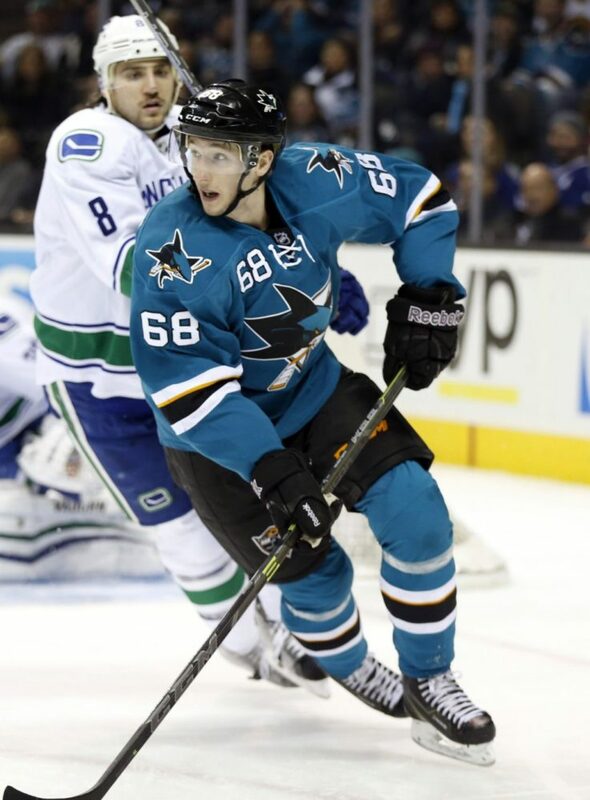 Joonas Donskoi, coming off a strong year playing for the Finnish league champions, will also get a long look. At 23, he is about six months older than Nieto, so his experience could set up him up for a role sooner than the others. In order to advance in this league, a player needs to play regularly and Nieto’s career will take a major step back if he becomes the 13th best forward for a team only playing 12 forwards a night. Nieto’s failure to progress with his offensive game and his struggles defensively put him on the bubble. He can get himself off the bubble with his play. Nieto will have pressure to either advance himself or make way for someone else.